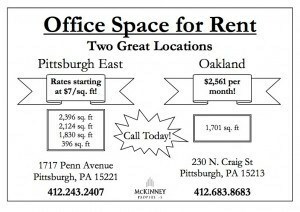 If your business or practice is thinking of adding another location or wishing to relocate, you may want to take a look at two properties that are priced right—one in the Churchhill area and the other in the Oakland area. It’s perfect for a small practice or any healthcare-related business. Click on their ad to learn more about these properties from McKinney Properties.